I colored the images with Copic markers. I love these babies---especially for blending various colors. I use to get so frustrated with watercoloring various fall colors onto leaves as watercoloring just wasn't as vivid or didn't blend well. I sponged my sky using a dauber and post-it note cloud template. I also sponged True Thyme lightly around the ground area so as to tone down the white of the cardstock for blending in with the colors of fall. I hope you can stop into StampTV and play. You have until next Wednesday, September 23, at 9:00 p.m. CST to upload your creation to StampTV. Your name will go into a drawing to receive a free Gina K. Designs stamp set (a $24.95 value!!)!!! Gina is so generous in that she gives a free stamp set for every challenge posted every week; that's a lot of stamp sets that she gives away!! And, if you're not a member of StampTV, it's easy to sign up and become one. Membership is free!! Here's a link to their main page. And, no, I was not asked to give this plug for StampTV. I just love the community of people there, the challenges, the forums, the magazines, the stamps/products, Gina's weekly video tutorials.....everything...and I want you to know about it, too! This is breathtaking Charlene! I LOVE everything you make, but this is OVER the top! Your coloring is DIVINE and I Love the layout!! This is awesome, Charlene! Fabulous coloring! Beautiful card for Fall! Love the vivid colors and design. Whoo, hoo Charlene! congrats on hosting the challenge! 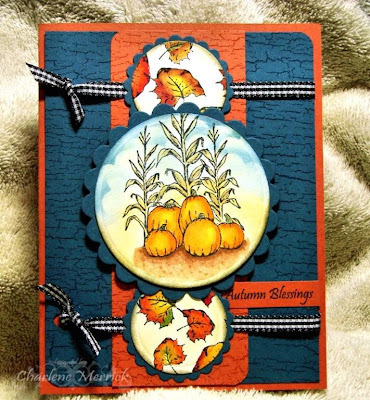 I love the colors on this wonderful fall card - the weathered bg is perfect! Wow Charlene!! Stunning!! Love the layout and the colors!! Congrats on hosting the challenge!! Your coloring, weathered background and scenes are gorgeous!! Way to go Charlene. This is beautiful. I have not gotten the coloring technique down with copics yet. I really like your dark background with these beautiful images. Great job.. Hey!! CONGRATS on hosting the sketch...and it looks like a FUN one! Your card is AWESOME!! Love the RICH colors, and your coloring is amazing! What a fun sketch this is! I love what you did with the leaves behind the main image....your coloring is rocking now-a-days. Very nicely done Bertie! Today is Friday, woot!!! Oooooo!! Your coloring is fabulous Charlene!! Wowsers!! Love the fall scene and fantastic sketch!! Yes, I can say I knew you when!! :) Beautiful card and I am a bit jealous you have the colors for those fall leaves in copics!! I will try to get to your sketch this week, Charlene, it's so cool!